Godawari Green Energy Limited (GGEL) received the commissioning certificate from RREC, the Rajasthan Renewal Energy Corporation Limited, for the first commercial scale Concentrated Solar Power (CSP) plant of India. GGEL, the 100% subsidiary of Godawari Power & Ispat Limited (GPIL) is Chhattisgarh’s leading steel & power company. GGEL received the certificate on recommendation by a committee constituted by Rajasthan State Nodal Agency and authorized by the NTPC Vidyut Vyapar Nigam Limited (NVVN); thus endorsing the 50MW project to be officially and commercially operative with effect from 19th June 2013. Taking a giant leap towards making eco-friendly energy in India, the CSP plant features state of the art parabolic trough, the technology named Euro-trough SKAL ET-150, and had commenced supplying infirm electricity to the grid on 5th June 2013, the “World Environment Day”. The plant has been built in approximately Rs. 800 Crores (USD 145 million) and is expected to displace approximately 11,30,000 tons of CO2 in a year. The plant is capable of lighting 200,000 Indian homes, while simultaneously preserving the environment. With its achievement, GGEL has been successful in building a road to sustainable energy solutions for India. Siddharth Agrawal, Managing Director of GGEL commented “It was an incredibly tough journey filled with challenges, questions, detours and self doubts, but the GGEL team exceeded the market’s expectations as far as project construction and commissioning was concerned. This has been a collective effort, and we are grateful to all who helped us realize this dream”. Though the technology is based on solar energy, it’s unique engineering ensures that the power plant can continue to generate electricity long after the sun sets or is obscured by clouds. CSP stations with parabolic trough technology are steam-driven power stations that generate electricity from heat. Parabolic mirrors arranged in long rows concentrate the solar radiation onto the receiver, inside which a carrier liquid is heated to almost 400 degrees Celsius. The heat, in turn, is used to raise steam that drives a conventional steam turbine and creates electricity. 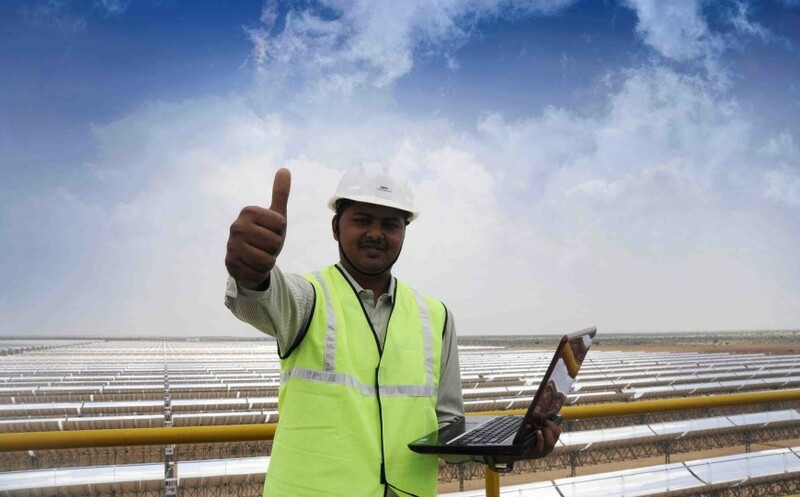 The extraordinary aspect about CSP electricity is its dispatch ability in the form of heat. The energy can easily be stored and fed into the grid when power is really needed, be it day or night, cloudy or sunny. This facilitates load management in grids – a factor destined to be of increasing importance as the contribution of solar energy to India’s electricity mix rises. GGEL was formed with an objective to tackle the growing energy requirements of the country in an ecologically sustainable manner. The company’s focus area is power generation using renewable sources such as solar energy, geothermal energy, wind energy, etc. with a mission to strike a balance between people, profit and the planet. GGEL pictures a sound environment, for they are working towards creating more sustainable energy solutions for India and around the world. GGEL’s experienced and expert team is targeted towards one goal, clean energy for everyone.